Punishingly slow, nearly four hours long, and so careful to avoid histrionics that it often approaches tedium, Shinji Aoyama’s Eureka is less a movie than a dare. It’s also one of the year’s most deeply felt and beautiful films, a meditation on death played out in crisp, sepia-toned images of such evocative power that they linger for days after seeing the film. 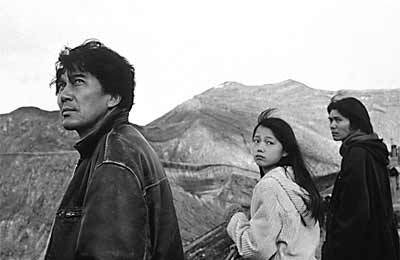 The film begins with a busjacking in a rural Japanese town. The scene is staged with unsettling delicacy. Aoyama forgoes easy shocks, preferring to let the situation play out slowly, casually building an unrelenting sense of dread. It’s a horrific scene, and we experience it from the point of view of the only passengers who survive – Sawai, the bus driver (Koji Yakusho of Shall We Dance? ), an adolescent boy named Naoki (played by Masaru Miyazaki) and his younger sister Kozue (Aoi Miyazaki). The film picks up their lives two years later, and we soon realize that the carnage of the opening has damaged them all. Very little happens for much of the film – there are fifteen minute long stretches where no one really says or does anything – but the tension generated by that first scene pulses through even the quietest moments, lending them an air of impending violence and desperation. These are people who have seen the very worst that life can offer, and the film chronicles their fumbling attempts to accommodate themselves to that knowledge. Sawai spends the two years after the busjacking wandering through Japan. When he returns home, nothing is as he left it: his wife has left and his relatives are terrified of him. Soon he finds himself the prime suspect in a series of brutal murders. The children’s lives also deteriorate: they lose their parents (one to drink, one to wanderlust), drop out of school and hole up in their old house watching television. Soon they stop speaking altogether. Only when Sawai arrives on their doorstep looking for a place to stay, followed by their cousin Akihiko (Yohichiroh Saitoh), on vacation from college, do they tentatively begin to re-enter the world. The plot suggests the sort of earnest drama where people bravely face up to their problems and begin to live their lives again. Eureka is infinitely more challenging: what Sawai and the children have to overcome is their intimate knowledge of mortality itself. They have experienced death at its most random and capricious and now live the rest of their lives in the wake of that knowledge. Aoyama has made a peculiar and difficult film. He puts the audience through its paces, demanding our patience as he builds a story less through drama than the accretion of small moments, all working towards a final scene of such emotional complexity and power that it justifies the film’s title. What holds it together until that point is the sheer force of the imagery. Each frame is composed with architectural rigor and is so richly textured – the grain dances in the rich lighting – that the film takes on a hypnotic sensuality. In a movie about finding reasons to live in the face of horror, its very beauty provides its best argument.